If you're headed to the beach or spending a day at a pool this holiday weekend -- or any day -- be sure to take our six must-have green products for fun in the sun. 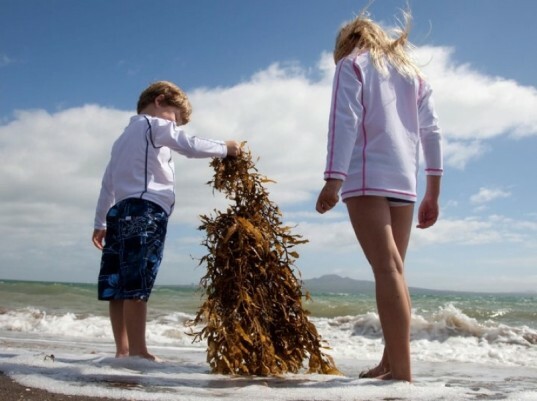 You can stay green whether on land, at sea, or in the pool with reusable swim diapers, beach towels, hats, beach bags, and swim shirts. And of course, don't forget safe, chemical-free sunscreens. If you’re going for a swim, you need a way to dry off — we recommend organic, chemical-free fabrics. Lil Honu’s organic cotton hooded bath wrap might seem slightly pricy for something that will be seeing a lot of sand this summer, but its generous sizing means that little ones can use the same towel for cozying up for multiple summers. It’s also pesticide free and dye free, so these comfy towels will just keep getting softer and better to snuggle up in. Pristine Planet also offers a plentiful selection of organic cotton or bamboo baby towels from brands like Kate Quinn Organics, Coyuchi, and Under the Nile. The site also has a useful search function so you can choose certains tags to narrow down the fabrics or qualities you are looking for. Going to the pool or beach doesn’t mean you have to buy packs of disposable swim diapers. Organic swim diapers are a great option for anytime your little ones need protection while exploring the water. Swedish brand ImseVimse (it means Itsy Bitsy in Swedish!) has gotten rave reviews for their all-in-one organic swim diaper/swimsuit. The brand has an array of cute colors printed with fish, sea animals, and polka dots. For another waterwear option, Tuga recently came out with swim diapers for boys and girls. Made in a variety of colors with their signature turtle print or a shark print, the Tuga swim diapers are UPF 50+, made from chemical-free fabric and can be washed and reused numerous times. They are approved for public pool use and even triple layered with an advanced bacterial-blocking lining to protect your tot (and others splashing near him!). Finding the right beach bag to lug all that stuff can be a tall order since said bag must hold everything from healthy snacks to game equipment to books. It also has to be sturdy enough to go everywhere and to withstand the little hands that are constantly reaching inside. Bee Country’s beach tote bags are funky and sort of rugged looking, which is definitely a plus when it comes to the abuse our bags take. 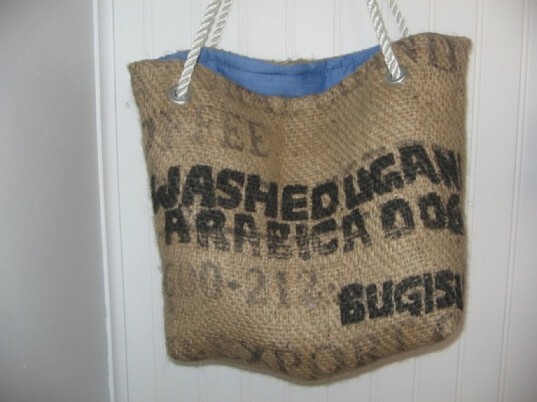 These upcycled bags are made from big coffee bean sacks and then lined with a variety of prints and patterns. A beach bag that doesn’t scream “I’m a Mom!”. The band-aids, diapers, and juice boxes that tumble out of it may, however, give you away. Using an organic cotton tote bag as a base, Ashley Austin of LovelyPiecesDesign applies individual pieces of Ashley’s own design patterns using an iron on transfer process. We love the bag’s whimsical, nature-inspired design and, best of all, the fact that the design is waterproof! This bag would also be great for going to the farmer’s market. Let older kids shoulder a bit of the load. 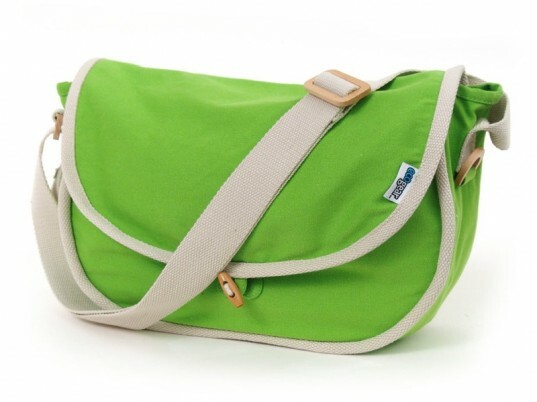 Made with organic cotton, PVC-free materials, recycled plastics and toxic-free dyes, bags from ecogear allow kids to be responsible for their own stuff (do you really need to spend 20 minutes searching for their iPod?) in a stylish way. The Gorilla (a messenger-style bag) and the Kids’ Panda (a more traditional backpack) come in cheery tween-friendly colors and can even transition to being used as a school bag come fall. Everyone should stay covered up from the sun, especially when spending long hours playing poolside or at the beach. 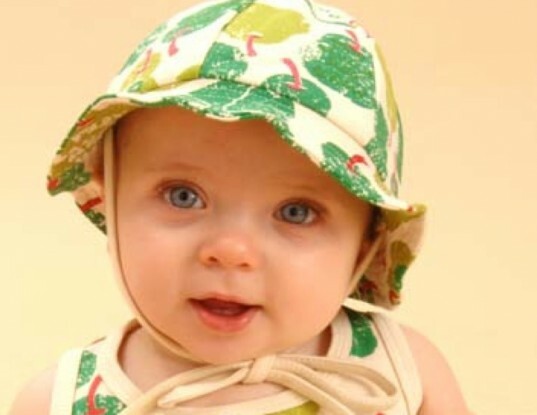 There are a lot of options for cute and functional sun hats for babies and kids. Keep infants in the shade and outfit-coordinated with Sckoon’s organic cotton sunhat with a pear print. The hat also matches several other apparel items, including Sckoon’s signature monkey pants, so baby can be all matched up for a stylish, seaside day. Sckoon’s products are made in fair-trade facilities. For the precociously stylish, go for Patagonia‘s trucker hat. It’s cool enough that kids won’t whine about how it looks, and the 47% organic cotton fabric content and adjustable sizing wins points from parents. 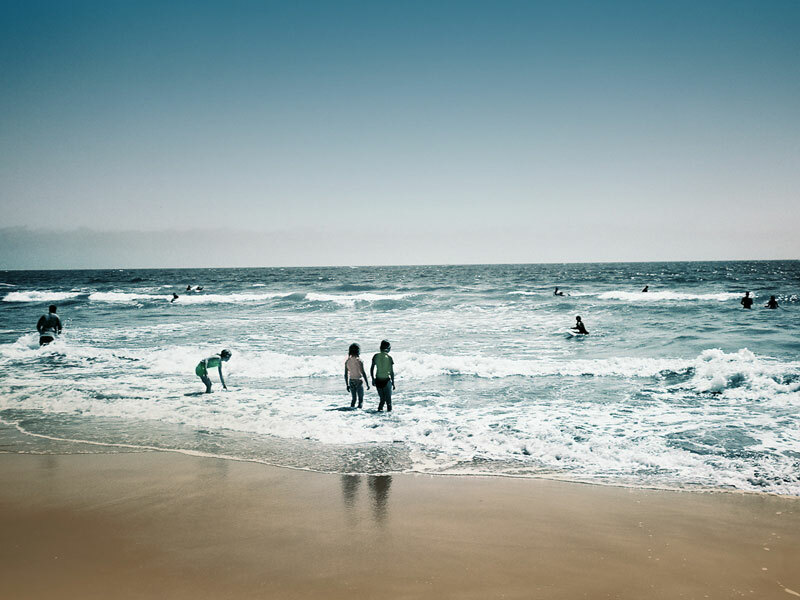 Protective swim shirts have become de rigeur for summertime, but many companies incorporate yucky chemicals as a method for adding protection from the sun. Snapper Rock eliminates that problem: It’s UPF 50+ rating comes from the density and tight weave of its fabric. Snapper Rock’s products were created with the help of a sailing design team, and the result is lightweight, breathable swim shirts that are functional, yet very cool. And for teeny tinies having their first (or second) summer, try Snapper Rock’s one piece swimsuit with short or long sleeves. 1. Towels If you're going for a swim, you need a way to dry off -- we recommend organic, chemical-free fabrics. Lil Honu’s organic cotton hooded bath wrap might seem slightly pricy for something that will be seeing a lot of sand this summer, but its generous sizing means that little ones can use the same towel for cozying up for multiple summers. It’s also pesticide free and dye free, so these comfy towels will just keep getting softer and better to snuggle up in. Pristine Planet also offers a plentiful selection of organic cotton or bamboo baby towels from brands like Kate Quinn Organics, Coyuchi, and Under the Nile. The site also has a useful search function so you can choose certains tags to narrow down the fabrics or qualities you are looking for. 2. Reusable Swim Diapers Going to the pool or beach doesn’t mean you have to buy packs of disposable swim diapers. 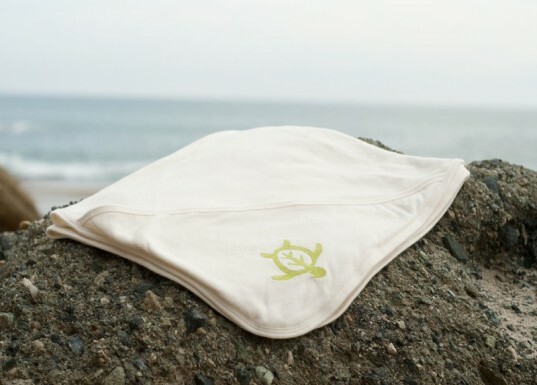 Organic swim diapers are a great option for anytime your little ones need protection while exploring the water. Swedish brand ImseVimse (it means Itsy Bitsy in Swedish!) has gotten rave reviews for their all-in-one organic swim diaper/swimsuit. The brand has an array of cute colors printed with fish, sea animals, and polka dots. For another waterwear option, Tuga recently came out with swim diapers for boys and girls. Made in a variety of colors with their signature turtle print or a shark print, the Tuga swim diapers are UPF 50+, made from chemical-free fabric and can be washed and reused numerous times. They are approved for public pool use and even triple layered with an advanced bacterial-blocking lining to protect your tot (and others splashing near him!). 3. Beach bags Finding the right beach bag to lug all that stuff can be a tall order since said bag must hold everything from healthy snacks to game equipment to books. It also has to be sturdy enough to go everywhere and to withstand the little hands that are constantly reaching inside. Bee Country’s beach tote bags are funky and sort of rugged looking, which is definitely a plus when it comes to the abuse our bags take. These upcycled bags are made from big coffee bean sacks and then lined with a variety of prints and patterns. A beach bag that doesn’t scream “I’m a Mom!”. The band-aids, diapers, and juice boxes that tumble out of it may, however, give you away. Using an organic cotton tote bag as a base, Ashley Austin of LovelyPiecesDesign applies individual pieces of Ashley’s own design patterns using an iron on transfer process. We love the bag’s whimsical, nature-inspired design and, best of all, the fact that the design is waterproof! This bag would also be great for going to the farmer’s market. 4. Kids' Bags Let older kids shoulder a bit of the load. Made with organic cotton, PVC-free materials, recycled plastics and toxic-free dyes, bags from ecogear allow kids to be responsible for their own stuff (do you really need to spend 20 minutes searching for their iPod?) in a stylish way. The Gorilla (a messenger-style bag) and the Kids’ Panda (a more traditional backpack) come in cheery tween-friendly colors and can even transition to being used as a school bag come fall. 5. Hats Everyone should stay covered up from the sun, especially when spending long hours playing poolside or at the beach. There are a lot of options for cute and functional sun hats for babies and kids. Keep infants in the shade and outfit-coordinated with Sckoon’s organic cotton sunhat with a pear print. The hat also matches several other apparel items, including Sckoon’s signature monkey pants, so baby can be all matched up for a stylish, seaside day. Sckoon’s products are made in fair-trade facilities. For the precociously stylish, go for Patagonia's trucker hat. It’s cool enough that kids won’t whine about how it looks, and the 47% organic cotton fabric content and adjustable sizing wins points from parents. 6. Swimshirts Protective swimshirts have become de rigeur for summertime, but many companies incorporate yucky chemicals as a method for adding protection from the sun. Snapper Rock eliminates that problem: It's UPF 50+ rating comes from the density and tight weave of its fabric. Snapper Rock's products were created with the help of a sailing design team, and the result is lightweight, breathable swimshirts that are functional, yet very cool. And for teeny tinies having their first (or second) summer, try Snapper Rock's one piece swimsuit with short or longsleeves.